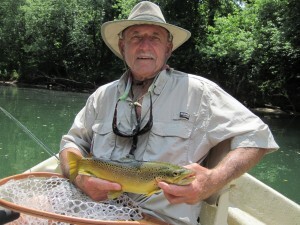 We finally had some low water on the Little Red River last weekend and the fly fishing was spectacular! Barry, from Kansas City, MO, and his pal, Alex from Telluride, CO, had a very large time in more ways than one and they caught an amazing number of fat Rainbows well into the double digits. With all the beer these guys brought there was barely enough room in the boat for Bo and I but we had a great day with two really fun loving guys! On Sunday we did a drift boat trip with our old friend Paul Broddick a little further down river and the fishing was just as good. 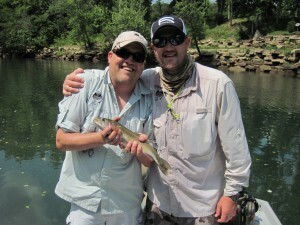 Paul caught a ton of fish including two slot Brown Trout. It is shaping up to be a great spring.